This is the second British paperback edition of Talking God, the ninth book in Tony Hillerman's Navajo Mystery Series. This edition was published in London, England by Penguin Books in 1993. Penguin Books is an imprint of PenguinGroupUK that publishes highly commercial good quality affordable paperback books.The cover art is credited to Instinct. 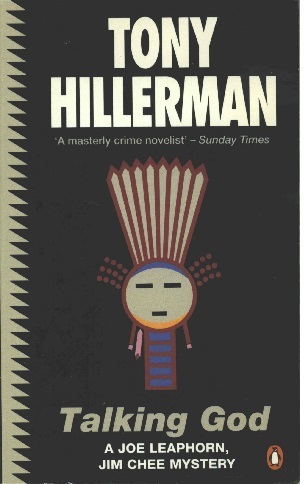 [i] PENGUIN BOOKS TALKING GOD and brief Tony Hillerman biography, [ii] blank, [iii] title page, [iv] publisher's imprint and copyright, [v] dedication, [vi] blank, [vii] acknowledgements, [viii] statement of fiction, 1- text,  blank,  advertisement,  blank, [243-248] advertisements. Format: Paperback, 18 x 11 cm. Binding: Paper covers with full color graphic on front. The author, title, an outline of the Talking God picture from the cover, the ISBN, and the publisher's logo are printed on the spine.